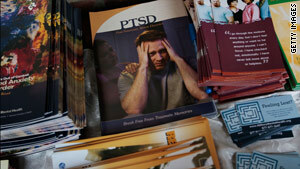 Pamphlets about post-traumatic stress disorder on a table last month at New York's Fort Hamilton Army Garrison. Washington (CNN) -- The Defense Department has agreed to expedite the claims of possibly thousands of Iraq and Afghanistan military veterans who suffer from post-traumatic stress disorder but have been denied benefits, a veterans group announced Monday. More than 4,000 veterans could be eligible for benefits available from a class-action lawsuit if they left the military because of PTSD, the veterans' advocacy group National Veterans Legal Services said at a press conference in Washington. The original class-action suit was filed in December 2008 by seven veterans who suffer from PTSD but who were denied a required rating to make them eligible for a variety of long-term benefits. A federal judge in Washington last month accepted a list of some 4,300 veterans who may also have been improperly denied the benefits. A court-authorized mailing is now going out to veterans on the list, telling them they can join the suit if they qualify. "The legal notice gives thousands of veterans the right to join this class action under terms that are likely to result in millions of dollars in monetary and health care benefits," said Bart Stichman, a spokesman for National Veterans Legal Services. Eligible veterans who respond to the notices will receive an expedited review of their disability rating and, if applicable, a correction of their military records to comply with the law. Benefits then would begin for six months until a further review and resolution of each medical case to establish permanent, long-term payouts. "I fought one war for my country abroad, but I now am fighting a different battle here at home," said former U.S. Marine Cpl. Tyler Einarson, 28, "the battle to get health care benefits to which I and thousands of other servicemen are entitled." Most of those eligible to join the lawsuit received disability discharges related to their military service in Iraq or Afghanistan from December 2002 through mid-October 2008, when the Defense Department is thought to have ended the challenged denials. Commentary: Why can't we share truth about war?